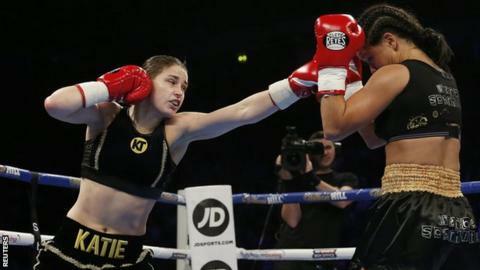 Ireland's Katie Taylor won her second fight since turning professional as she claimed a points victory over Brazil's Viviane Obenauf in Manchester. Super-featherweight Taylor, an Olympic Games gold medallist in 2012, won by a 60-53 margin after a fine performance. Obenauf was knocked down in the second round and was outclassed throughout. The Brazilian suffered a bad cut, near her left eye, after a clash of heads in the fifth round, but went the distance as Taylor comfortably got the verdict. In a contest which consisted of six two-minute rounds, 30-year-old Taylor began strongly with a succession of body shots and a left-hook counter that rocked Obenauf's head back. Obenauf, who had won nine of her previous 10 professional bouts, received a count in the second as she attacked Taylor but fell after being caught on the top of the head. Taylor was in control with superior footwork, speed and variety of punches, although her opponent battled to the final bell, despite suffering that bad cut in the fifth round. Taylor turned professional after losing in the quarter-finals in the 2016 Rio Olympics and claimed a third-round stoppage win over Poland's Karina Kopinska in her debut last month.